Awww! 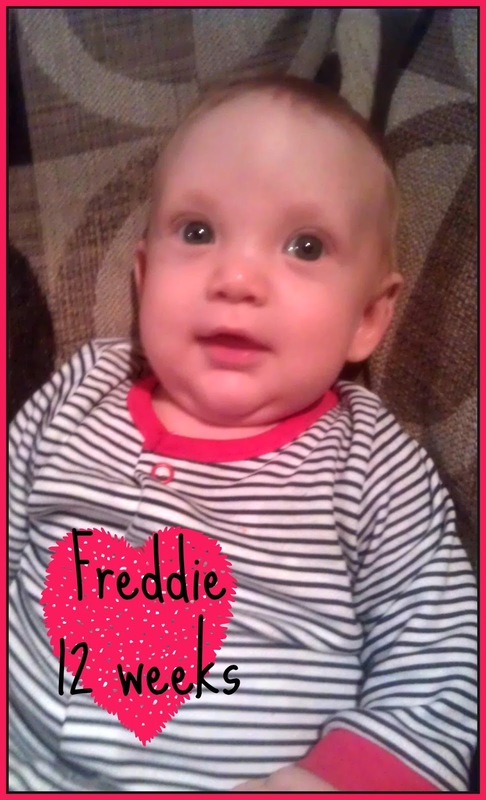 Our Freddie is 12 weeks old already! How did that happen? How has it been 12 whole weeks? He really is Fantastic Freddie too. His brothers still adore him to the point of smothering him. He still screams when ever Daddy picks him up (on account of being "not da mama!") and he still loves Mummy best. He is still exclusively breastfed. He is still predominantly worn in a sling over being pushed in a pram (coz he hates lying in the pram). He still spends a LOT of the night in our bed! And he is a very happy little man. In the last few weeks he has found his smile - and it's a cracking one! He's becoming very chatty and he giggles. The boys love that he says the same thing they did as babies "Ahh-goooo!" He hates having a mucky bum and is the only one of my babies who has ever liked having his nappy changed. He seems to love it! If he's crying because he's mucky and then realises that he's been laid on his change mat, he is suddenly all smiles. He doesn't even cry at being cleaned with cold wipes or having his bum cream applied! All his brothers SCREAMED when they were his age! He likes to face outwards in the sling now, so he can see more. He likes to watch his brothers and Daddy while they potter about doing their normal every day things. He loves to sit on my knee when the bigger boys read their school books, cooing and ahgooing at them while they read - I swear he thinks he's having a conversation with them! He wants to sit up all the time. He wants to chew things all the time. He is getting closer and closer to being able to put things in his mouth himself.... and I'm not really looking forward to that bit! He likes to push with his feet and try to stand up when I hold him on my knee. I'd love to try him in the bouncer - but his brothers would only swing him all over the place. The baby gym is currently useless as every time I lay him on it he either goes to sleep or get mobbed by his brothers who just want to play with him. These weeks and months are flying by. It would be just perfect if I could freeze time right now... and spend forever with my boys just as they are right now. I love being their mum!